Worth mentioning is that this Breaking Dawn - Part 2 teaser trailer is one of the best – perhaps the best – Summit has come up with for any of the Twilight Saga movies. Breaking Dawn - Part 2 trailer too confusing? Now, if you're watching the Breaking Dawn - Part 2 trailer and don't know what the heck is going on, here is a brief plot synopsis: Bella Swan-Cullen (Kristen Stewart), now a full-fledged vampire, attempts to protect her family – including baby daughter Renesmee (Mackenzie Foy) – from the cunning, ruthless, mortally dangerous Volturi (Michael Sheen [kinda looking like Johnny Depp in Alice in Wonderland], Dakota Fanning, Christopher Heyerdahl, Cameron Bright, Jamie Campbell Bower, Charlie Bewley). The Volturi think Renesmee is a baby vampire, which would make her not only a nuisance like most babies, but also a danger to both their secret and their livestock (humans). In sum: Breaking Dawn - Part 2 is a tale about family values. “I'll never let anyone hurt you,” Bella tells little (but fast-growing) daughter Renesmee at the end of the Breaking Dawn 2 trailer. But don't despair. BD2 also offers some good stuff – “imprinting,” revenge, murder – to make this Family Movie more interesting and entertaining than most others. Now, those who have read Breaking Dawn will probably be wondering about that final sequence, when the two groups – the Cullens and their allies; the Volturi and their allies – dash toward another … Is that gonna be a group hug or something? I won't say anything else. In addition to leads Kristen Stewart and Robert Pattinson and Taylor Lautner, and the aforementioned supporting players Michael Sheen, Dakota Fanning, et al., Breaking Dawn - Part 2 features Billy Burke as Bella's father, and Cullen Clan members Peter Facinelli, Elizabeth Reaser, Kellan Lutz, Ashley Greene, Nikki Reed, and Jackson Rathbone. Plus Werewolf Pack members Julia Jones, Booboo Stewart, Alex Meraz, Bronson Pelletier, Kiowa Gordon, and others. And finally, Breaking Dawn 2 will feature a number of guest vampires, among them Maggie Grace, MyAnna Buring, Mia Maestro, Christian Camargo, Angela Sarafyan, Daniel Cudmore, Omar Metwally, Casey LaBow, and Rami Malek. Bill Condon directed from a screenplay by Melissa Rosenberg, based on Stephenie Meyer's book. The Twilight Saga: Breaking Dawn - Part 2 opens Nov. 16. 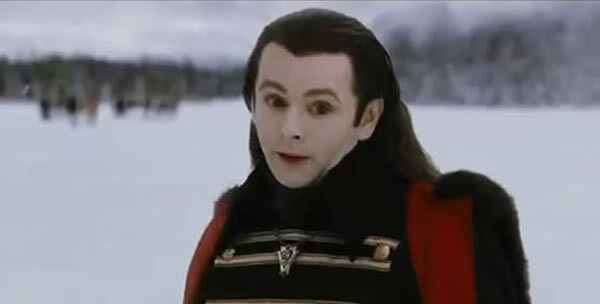 Michael Sheen / Volturi Breaking Dawn - Part 2 trailer screengrab: Summit Entertainment. Breaking Dawn - Part 2 opens November 16. Besides Kristen Stewart, Robert Pattinson, Taylor Lautner, Mackenzie Foy, Michael Sheen, Dakota Fanning, and Jamie Campbell Bower, the Breaking Dawn 2 cast includes Cullen Clan members Peter Facinelli, Elizabeth Reaser, Kellan Lutz, Ashley Greene, Nikki Reed, and Jackson Rathbone, in addition to Booboo Stewart, Billy Burke, and Maggie Grace. Plus: Julia Jones, Christopher Heyerdahl, Lee Pace, MyAnna Buring, Angela Sarafyan, Cameron Bright, Rami Malek, Joel Anderson, Noel Fisher, Alex Meraz, Christian Camargo, Mia Maestro, Ty Olsson, Charlie Bewley, Daniel Cudmore, Kiowa Gordon, Omar Metwally, Casey LaBow, Bronson Pelletier, Erik Odom, Guri Weinberg, and Lisa Howard. Robert Pattinson / Edward Cullen Breaking Dawn - Part 2 poster: Summit Entertainment. Directed by Gods and Monsters / Dreamgirls' Bill Condon from a screenplay by Melissa Rosenberg (based on Stephenie Meyer's bestselling novel), Breaking Dawn 2 is the final installment in the Twilight Saga movie franchise. The movie opens November 16. In Breaking Dawn 2, Bella and husband Edward Cullen (Kristen Stewart and Robert Pattinson) face off against the Volturi (Michael Sheen, Dakota Fanning, and others) so as to protect their hybrid baby Renesmee (Mackenzie Foy). Though harmless, like so many creatures of mixed heritage the part CGI-part human baby Cullen must endure all sorts of nasty prejudice. In fact, Renesmee's mere existence could mean the very end of the Cullen Clan. It could also mean “imprinting” on the part of Jacob (Taylor Lautner), a werewolf who may have chosen that hybrid baby or no, Renesmee is his One and Only. Besides Kristen Stewart, Robert Pattinson, Taylor Lautner, Mackenzie Foy, Michael Sheen, and Dakota Fanning, the Breaking Dawn 2 cast includes Cullen Clan members Peter Facinelli, Elizabeth Reaser, Kellan Lutz, Ashley Greene, Nikki Reed, and Jackson Rathbone, in addition to Booboo Stewart, Billy Burke, Maggie Grace, and Jamie Campbell Bower. Kristen Stewart / Bella Swan Breaking Dawn 2 poster: Summit Entertainment. May 24: Taylor Lautner returns as the shapeshifter / werewolf Jacob Black in one of three The Twilight Saga: Breaking Dawn - Part 2 character posters released earlier today. The other two Breaking Dawn - Part 2 posters star red-eyed newborn vampire Kristen Stewart and golden-eyed centenarian vampire Robert Pattinson. 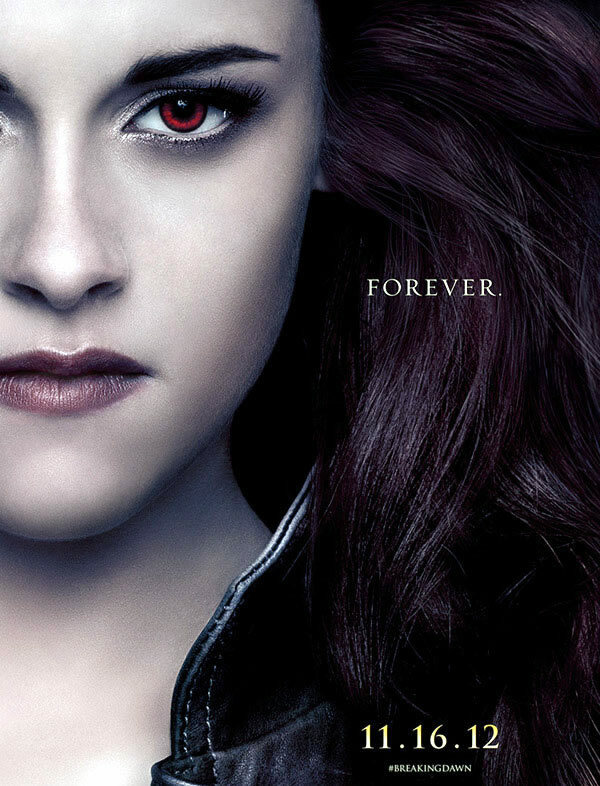 Since vampires are immortal, all three posters feature the tagline “Forever.” Now, I don't think werewolves live forever. 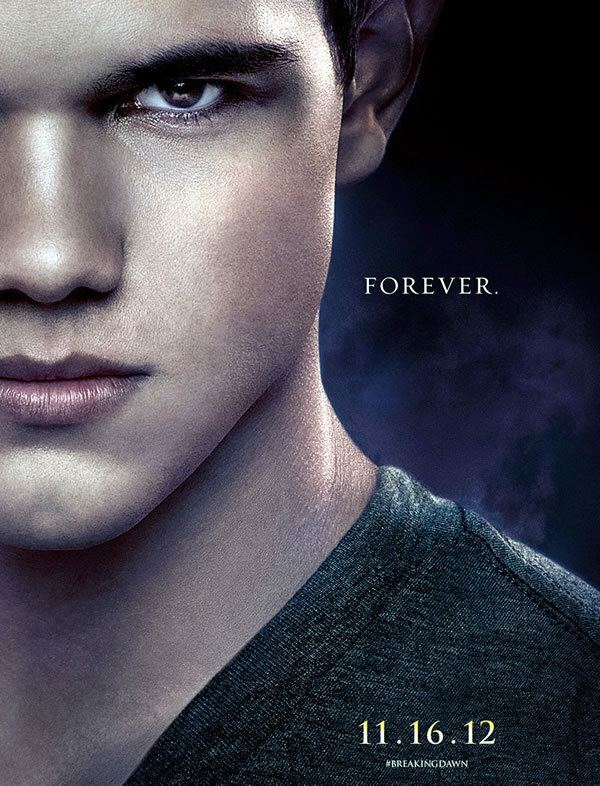 Jacob's poster should read “For now,” especially considering how his affections shift from Bella to another key character in Breaking Dawn - Part 2. Directed by Kinsey / Dreamgirls' Bill Condon from a screenplay by Melissa Rosenberg (based on Stephenie Meyer's novel), Breaking Dawn 2 is the final installment in the Twilight Saga film series. In Breaking Dawn - Part 2, Edward Cullen and his newborn-vampire wife Bella Swan-Cullen (Robert Pattinson and Kristen Stewart) must stand their ground against the ancient Volturi Clan (Michael Sheen, Dakota Fanning, Jamie Campbell Bower, and others) in order to protect their hybrid baby Renesmee (part Mackenzie Foy, part Chucky-like computer-generated imagery). Though harmless, Renesmee is perceived to be a dangerous baby vampire. Taylor Lautner / Jacob Black Breaking Dawn - Part 2 poster: Summit Entertainment. May 5: Life imitates art once again. At the end of Twilight, Bella Swan goes to the prom wearing a cast. In order to dance, she must climb on top of Edward Cullen's feet, so he can sway to the music for both of them. Well, it turns out that Bella herself, Kristen Stewart, has hurt her foot while working on The Twilight Saga: Breaking Dawn - Part 2 reshoots, or “pickup shots” or “additional shots” or whatever you want to call them. Remember, Bella was transformed into a vampire at the end of Breaking Dawn 1. Once you become a born-again vampire, your baptism of sorts is your first hunt. The Cullen clan consists of “vegetarian” vampires, and Bella is now one of them. That's how Breaking Dawn 2 kicks off. Among those also in Vancouver were Breaking Dawn 2 director Bill Condon, and Stewart's fellow actors Robert Pattinson and Michael Sheen. Also of interest was Kristen Stewart's remark that “I grew up on a movie set,” as her mother was a script supervisor and her father a stage manager. Stewart then mentioned her first role, tossing a pre-historic ring in the horror movie The Flintstones in Viva Rock Vegas, and just by chance – amazing, isn't it? – Leno had a clip of the film showing Stewart's back as she tosses the ring. Adapted by Melissa Rosenberg from Stephenie Meyer's bestselling novel, Breaking Dawn 2 will be released on Nov. 16. Besides Kristen Stewart, Robert Pattinson, Michael Sheen, and Mackenzie Foy, the Breaking Dawn 2 cast includes Taylor Lautner, the vegetarians Peter Facinelli, Elizabeth Reaser, Kellan Lutz, Ashley Greene, Nikki Reed, and Jackson Rathbone, in addition to Dakota Fanning, Booboo Stewart, Jamie Campbell Bower, and Billy Burke. Plus: Maggie Grace, Julia Jones, Christopher Heyerdahl, Lee Pace, MyAnna Buring, Angela Sarafyan, Cameron Bright, Rami Malek, Joe Anderson, Noel Fisher, Alex Meraz, Christian Camargo, Mia Maestro, Ty Olsson, Charlie Bewley, Daniel Cudmore, Kiowa Gordon, Omar Metwally, Casey LaBow, Bronson Pelletier, Erik Odom, Guri Weinberg, Tinsel Korey, Chaske Spencer, and Lisa Howard. Kristen Stewart photo: The Tonight Show. If you've read the books, you'll know that Jacob can choose forever, based on continuing to phase into wolf-form. Given the longevity of his chosen partner, it's hard to imagine him choosing another path.